Anthony William, the one and only Medical Medium, has helped tens of thousands of people heal from ailments that have been misdiagnosed or ineffectively treated or that doctors can't resolve. He's done this by listening to a divine voice that literally speaks into his ear, telling him what lies at the root of people's pain or illness and what they need to do to restore their health. His methods achieve spectacular results, even for those who have spent years and many thousands of dollars on all forms of medicine before turning to him. Now, in this revolutionary book, he opens the door to all he has learned in over 25 years of bringing people's lives back: a massive amount of healing information, much of which science won't discover for decades, and most of which has never appeared anywhere before. 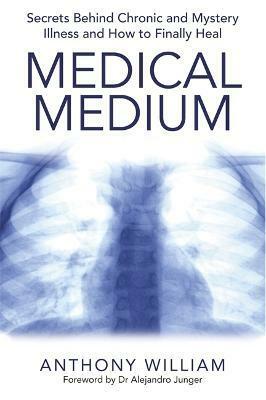 New York Times bestselling book Medical Medium reveals the root causes of diseases and conditions that medical communities either misunderstand or struggle to understand at all. It explores all-natural solutions for dozens of the illnesses that plague us, including Lyme disease, fibromyalgia, adrenal fatigue, chronic fatigue syndrome, hormonal imbalances, Hashimoto's disease, multiple sclerosis, depression, neurological conditions, chronic inflammation, autoimmune disease, blood sugar imbalances, colitis and other digestive disorders, and more. It also offers solutions for restoring the soul and spirit after illness has torn at our emotional fabric. Whether you've been given a diagnosis you don't understand, or you have symptoms you don't know how to name, or someone you love is sick, or you want to care for your own patients better, Medical Medium offers the answers you need. It's also a guidebook for everyone seeking the secrets to living longer, healthier lives. Within the first three minutes of speaking with me, Anthony precisely identified my medical issue! This healer really knows what he's talking about. Anthony's abilities as the Medical Medium are unique and fascinating, and his book makes complex diseases that confuse even many doctors easy to understand and address. Highly recommended.